What exactly is the role of the National Football League in American society? It is, by far, the most popular sport in the country, and the Super Bowl continues to break the record for most-watched televised event in history. The relationship the NFL has with American society is complex, and to better understand it you have to look at the fundamental elements of football as a game, the NFL as a league, and the league’s relationship with broadcast television. But for now I just want to look at the elements that are well known and constantly in the public sphere. The NFL is not only a professional sports league, but it is also a symbolic institution in American society, and it embodies American society through hyper-representation. All aspects of its media production work to push its viewers toward a perspective of traditional and conservative American values, which include ideals found in Bellah’s (1967) American civil religion such as: nationalism, militarism (freedom), Christianity (patriarchy), consumerism, and corporatism. This bundle constitutes an idealized representation of traditional America. The representation of this media ritual is structured in such a way that the viewer is left with almost no option other than to want to identify with this idealized representation because choosing to not identify then seems un-American. Consequently, the NFL acts as the “last frontier” for traditional American values. This becomes very important when considering the endorsements and cultural shifts that the NFL embraces. One especially important move was when the league was fully integrated in 1962, shortly after Jim Crow laws started to fold-over in courts across the nation. Another is when, last year, the unanticipated Richie Incognito bullying scandal broke out of the Dolphins locker room. The NFL is now expected to publicize Incognito’s severe consequences to draw attention to the punishments of bullying. Such moves have not only been made with bullying but also with race. Finally, now, the NFL is on the brink of authorizing homosexuality. And, because of the way the NFL represents a traditional American-ism, having a dominant, influential American institution endorse homosexuality would be a major step in integrating homosexuals into this American identity. America largely showed strong support for LGBT athletes, and the LGBT community in general, during the 2014 Sochi Winter Olympics, but there seems to be a nervous tension surrounding the prospect of Michael Sam, an openly gay football player, joining the NFL. Last year Jason Collins became the first openly gay players in the NBA, which is often referred to as “one of the major sports.” The phrase, “a major sport,” is referring not to the actual sport, but rather the professional leagues that manage the sport, which include the NFL, NBA, MLB and NHL. Even though the NBA and MLB are often grouped together with the NFL, they are simply not the NFL for many reasons. First, the sheer size of the NFL’s popularity, second, and more problematic, football is an exclusively a male sport with no sister-sport on the professional level (unless you want to include the bikini league), third, there are very few foreigners playing in this league, and lastly, NFL carries the torch for traditional American values and ideals. This last point is what sets the stage for the National Football league to be America’s gauge, a type of moral compass for our society. Popularity and the embodiment of American culture, which applies more to the NFL, make them a “major” sport and is how the NFL has become a significant rite of passage for shifts in American society. When the NFL comes into the picture surrounding an instance like homosexuality you can really see the two sides of American society stand apart from each other. On the one hand, you have one of the most liberal, pro-equality, progressive countries in the world, and on the other you have one of the most conservative, traditional countries rooted in traditional religious values. In the former instance the NFL is like a large part of our society that is entertaining and has some historical and cultural significance, and in the latter instance the NFL is like America’s Vatican, but with more power. The NFL is unique in its power because, in part, it embodies both sides of the split in society by constantly putting the larger American umbrella over it evoking a civil religious following, which makes America a core part of its identity (the stars and strips are in the logo). Watching the Michael Sam phenomenon play out in sports media recently has been exemplary of how the two sides come together (not a smooth juncture) and unite under the one American umbrella. Once the culture of the NFL puts its stamp on an issue, the people tend to follow. The NFL doesn’t have an authority figure who makes independent decisions (however, Roger Goodell, the commissioner, is responsible for the league and is employed by a group of millionaires and billionaires: the owners). The fact that the Super Bowl is aired on the four major networks on alternating years shows that it is suitable for most any bias and audience in America. So really the league’s relationship with the fans is what dictates the sport, and most of that relationship is communicated through sports media, which has grown exponentially in recent years. In fact, the players and sports media have a huge presence outside of sports. Professional star athletes are revered as modern-day superheroes, and now with the use of Twitter, they can and do offer their opinion about going-ons in society, which makes their presence and influence even greater. In addition, they become celebrities and receive endorsements, but they do this so much they are no longer merely players of a game, but figureheads in a society. What’s more, many of the popular players become members of the sports media when they finish their athletic careers. This is especially the case with football media; most of the commentators and analysts are former players and coaches. So, the mediators between football and society largely consist of people who are ingrained in the culture of football. 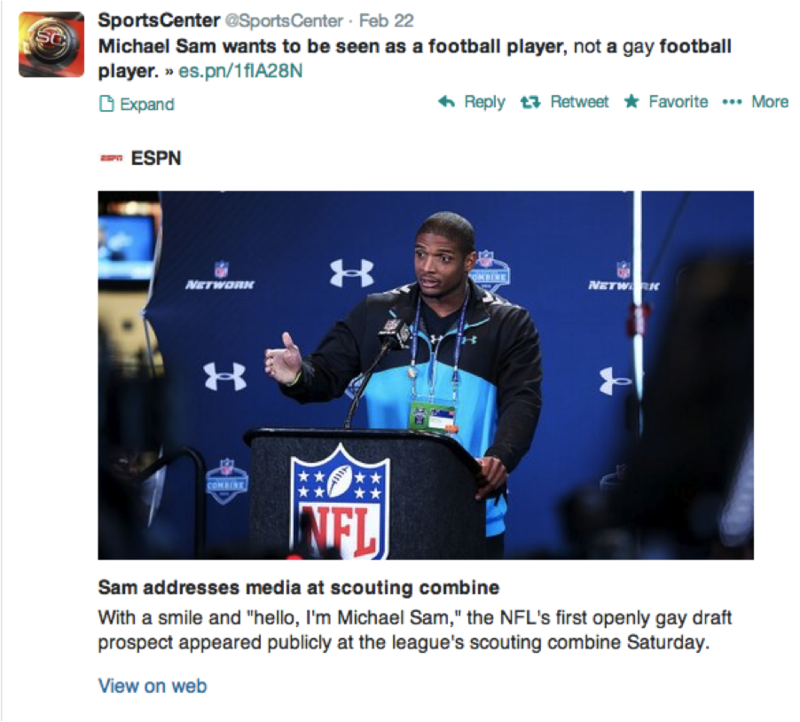 Many people in social media are ready to think of Sam as just a football player instead of a gay football player, thus adding him to the NFL’s American identity despite his sexual orientation. It is interesting when you have these analysts (former players) react to Sam’s sexuality. An audience standpoint coincides with the perspective of the analysis because the NFL culture because they are the voice of the league, a league that tirelessly works to be synonymous with American culture. That’s when you see the two sides or perspectives of what American culture is, or should be, arise. The liberal side of American culture has become quite dominant as of late so an institutional NFL action against Michael Sam is almost unimaginable. The NFL is so ingrained with the culture that they have no choice but to follow its demands. So the NFL will put its stamp of approval on homosexuality in American football, and that approval will serve as a rite of passage for homosexuality in American culture.